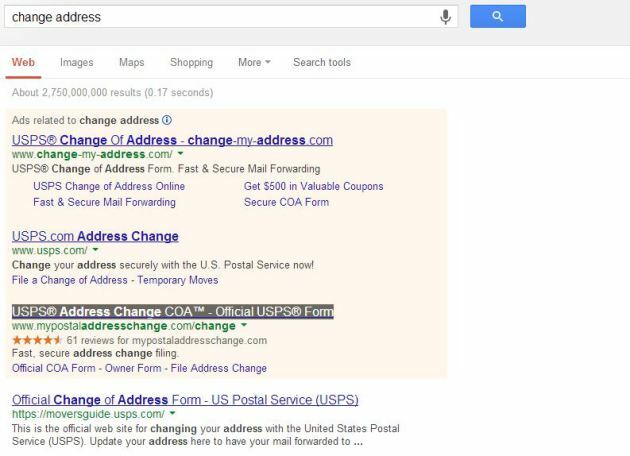 A company featured as one of the top websites when typing "change address" in Google is charging up to $40 for a service that is typically free, according to the Better Business Bureau of Minnesota and North Dakota. MyPostalAddressChange.com offers "fast, secure address change with the post office (USPS)." The BBB said in a warning last week that the company is charging up to $40, when consumers can change their address at a post office for free. Consumers were deceived into believing they were dealing with the U.S. Postal Service when filling out the information on the company's website, the BBB said. The website's fine print says they are not affiliated with any government agency. The company appears to be operating out of Australia, the BBB said. Consumers can change their address at a post office for free, or they can visit www.usps.com, and pay a $1 identity verification fee.